Quite a bit of buzz was created around the announcement of Apple’s new smart speaker: the HomePod. This is a market that is already full of lots of options from companies such as Sonos, Google and Bose. To break into this and be successful, the HomePod would have to be very special. The initial reviews suggested it blew every other speaker away and for the size of it (only 7” tall) the sound it produces is both room filling and that of a speaker much larger than itself. This much hype has led to much scepticism…is it really this good? We managed to get a HomePod to test and for around two months now, during this time we have put it through its paces. My first impressions were that it is a doddle to set up, you just hold your iPhone close by and that’s it! It will link to your iCloud account so that you can use the inbuilt Siri functionality to control your music purchases as well as your calendars, notes and reminders. Sound-wise (I must admit, I am no audiophile), it produces a detailed sound that is clear and you can really differentiate each instrument. This makes it a pleasant speaker for background music. One of the best features about the speaker is the Siri control, this is due to its six microphone array. Its ability to pick up your voice above the music and to accurately understand what you are saying is very impressive. Siri is the main control for this speaker so this aspect had to be nailed, which I am happy to say this has been achieved. Along with the more familiar Siri controls such as “Play the Rolling Stones” and “What is the weather?”, you can control the volume with precision by asking to use a specific volume, as well as asking what level the volume is at currently. There is also the ability to ask to play news stations, like Sky, to hear the latest updates from around the world. One thing I’ve noticed is that it can sound a bit muffled when you try to push a song that has a significant amount of bass through it. An example of this is with the song – You Make Me by Avicii. However, you only notice this when you ramp up the volume to a point where you would no longer be sociable. I have noticed that some songs will vary in how they are reproduced through the speaker, which is to be expected as some music is now mixed very differently, so the muffling I heard could well be down to the track I was listening to. The speaker’s primary source for music is Apple Music , Apple’s paid for subscription service (think Spotify or Deezer). If you have this service then I’d say the HomePod is a definite option for you to consider. If you do not then it is harder to incorporate the speaker into your life. Whether Spotify will be integrated at a later date I cannot say but until then AirPlay is the way to go. (no Bluetooth or AUX here) which works well but it means you can no longer use Siri to choose music as you would with Apple Music, meaning you would be missing out on the very good Siri integration. From a purely aesthetic point of view, I think they have done a stellar job with the design. The speaker is small and compact and would easily disappear on the shelf or table at home. 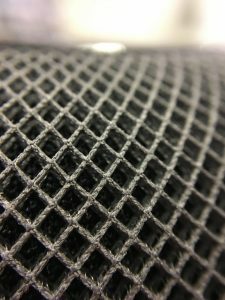 Available in white or black, the speaker is covered in a mesh like fabric which feels premium and sturdy. On top of the speaker is small OLED screen that when activated Siri has a small glowing icon to indicate it’s listening to you. Other than that, it just shows a plus and minus for the volume. It is hard to fault the design, maybe the lack of physical buttons could be off putting for some, but the lack of buttons gives it a sleek finish that none of its rivals (aside maybe the Sonos One) can come close to. On the whole, the HomePod is an exciting development from Apple. This first version (I assume there will be updated versions in the coming years) is a bold attempt from Apple to enter a rapidly saturating market. It is well rounded and the sound is impressive for its size, with enough detail to really bring your music to life. The Siri integration is a big plus and its ability to hear and understand you without a fuss really shows how well engineered it is. HomePod does have some drawbacks the cost is perhaps higher than other speakers on the market and the fact that you need an Apple Music subscription to get the full use out of it. For now, it is an interesting option for those already invested into the Apple Ecosystem. If you are, then this speaker is perfect for you as it could be the missing piece of your Apple puzzle. There are future updates planned for the speaker including stereo mode which enables two speakers to play together as a pair. 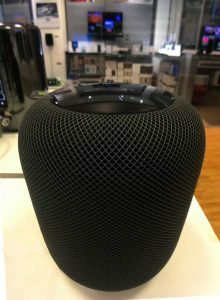 So if you get one now then you will be continually updated with new features as they become available, making the HomePod a speaker that will adapt over time to bring you more features that will enhance your home audio and keep you rocking along! With Techbenefits, you experience the joy of new technology in exchange for a small monthly salary contribution. There’s no deposit, no credit check, no interest and no waiting.